Dry at 135* for 8-12 hours till brittle hard. Smaller types of pasta dry fastest and recook in bags at a faster rate. 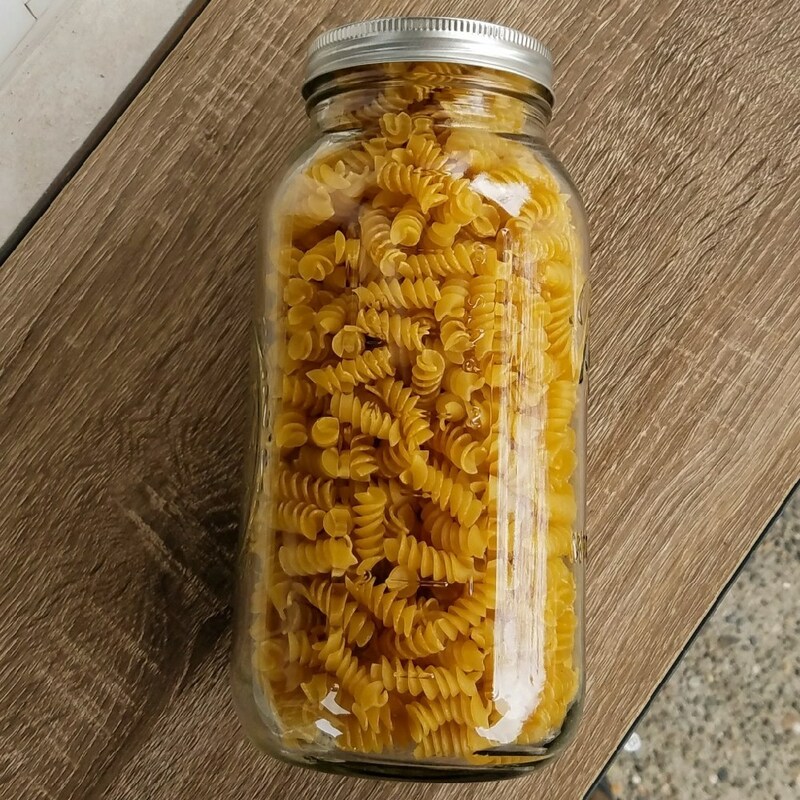 Rehydration is equal amounts of water to pasta. 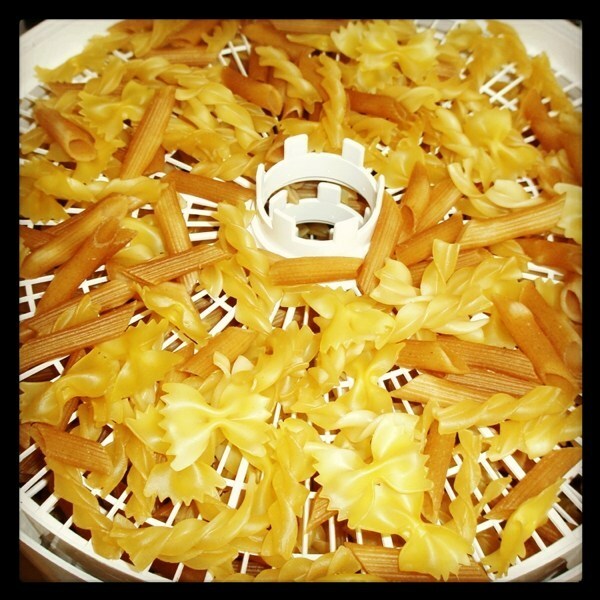 As a tip, under cook your pasta by one to two minutes, as it will finish cooking while being rehydrated. In camp use boiling water, and let sit in a cozy for 5-15 minutes. Simply a deep taste and as well the texture that good quality rice has. Sadly with commercial instant rice you do have a major trade off. In burritos or used in soups on the trail it isn’t so noticeable. But if your rice is the focal point it can come up very lacking. Drying your own rice can open up a vast array of choice from Jasmine, sticky rices, brown, black, red and even wild rice. If you can buy the rice at the store you can dry it up! Considering you can find only white and a not-so-great brown rice in the majority of grocery stores, this allows you to have many more gourmet meals – and it only takes an hour or so total of your time to do it. Cook your rice how you prefer making sure you don’t add in oil or fat. For white rices I often bring 3 cups water to a boil and add in 1 1/2 cups rinsed rice, bring it back to a boil, stir well and put the lid on. Turn it down to low and let it simmer gently for 20 minutes. When done fluff the rice up well. Spread the cooked rice on prepared dehydrator trays – if you have fine mesh screen use them, if not line your trays with parchment paper. 1 1/2 cups uncooked rice takes up about 2 trays when cooked. Dry at 135-145*. For rehydrating use a ratio of 1:1. For 1 serving from above add 3/4 cup boiling water to the 3/4 cup dried rice. Stir well and put in a cozy for 15 minutes. Serve as usual! The texture of the rice tastes almost the same as when it came out of the pan. Try drying your own and you most likely will never go back to using commercial instant rice. Bamboo rice is an incredibly pretty rice. It is a sticky (glutinous) rice that is infused with bamboo juice leaving it vivid green. When cooked it has an herbal smell and flavor. In sushi it is awesome. It supposedly has quite the boost of B vitamins as well. I prepared a double batch of rice – 3 cups water brought to a boil, adding in 1 1/2 cups rice. Bring back to a boil, stirring, cover and drop heat to low. Let cook for 15 minutes. Take the lid off and scoop out the rice, fluffing it up. the 2 cups raw rice will produce about 6 cups cooked. I spread about 2 cups cooked rice on each mesh lined dehydrator tray. The rice was dried at 135* for about 5 hours. Humidity may affect that – so start checking at 3 hours. Break up clumps as well. When dry it produced 3 cups rice. To rehydrate use a 1:1 ratio of water to rice. A 1/2 cup serving would work well with other items. Slowly gaining a following here in the US is Quinoa, a seed that is native to South America. Some of its highlights? It is a complete protein, high in fiber and calories. It is gluten free and cooks up relatively fast. We get asked a lot on how to make the grain Quinoa more trail friendly. While it is a very fast cooking grain (10-20 minutes) it usually requires rinsing and draining it well before you cook it on trail, as the seeds have a bitter natural coating that must be rinsed away. If you haven’t seen it look near the rice section in grocery stores. It can be used in place of rice or couscous in many dishes. A standard serving is 1/4 cup dry uncooked. For trail use I would recommend 1/2 cup uncooked. This provides roughly 240 calories, 6 g fat, 10 g protein and 6 g fiber. Take a fine mesh colander and pour 1 cup uncooked quinoa in it. Rinse it well with cold water and drain. Add it to 2 cups water in a medium saucepan. Bring it to a boil, stir, put on the lid and lower the heat to Low. Let simmer gently for 10-20 minutes. It may need up to 20 to absorb all the water. Once done fluff up and spread on a lined dehydrator tray. Quinoa is very small and will fall through most mesh liners. I would recommend that you line your tray(s) with parchment paper. Dry at 135* till dry. As with rice be sure to check every hour and break up any clumps with clean fingers. You might think “well, now it is more volume and weighs a tiny bit more, how am I saving anything?”. The beauty of it is you don’t need to cook it (saving fuel and time) and all you need to do is add a 1:1 ratio of boiling water and let it sit in your cozy for 10 minutes. No cleanup or burnt on messes. Ready to go when you are! Use it in any of your favorite recipes, it is nice added to vegetable soups in winter.